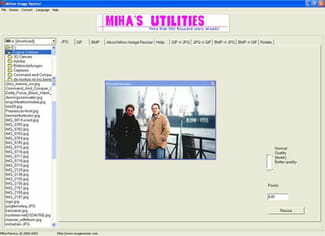 Mihov Image Resizer is a software designed by Miha Psenica. As its name already suggests, it is used for image resizing and converting. Detailed below are some of its features. The software gives the possibility to modify the size of the image following a scale pre-defined by the user. If the image is displayed upright, there is a specific button which allows rotating it in the right direction. Before saving the right image, Mihov Image Resizer also enables the user to convert it between different formats for it to be readable, lightweight and will not occupy too much place in the hard disk. It can convert multiple images simultaneously. With this utilitarian, the user is just one click away from creating thumbnails, which allows to quick load pictures and images of reduced size. This operation will not have any consequences on the image's quality. The download of Mihov Image Resizer is completely free of charge. It is available in different languages. It offers a link to recently open folders for fast browsing.